Category: Body Care. 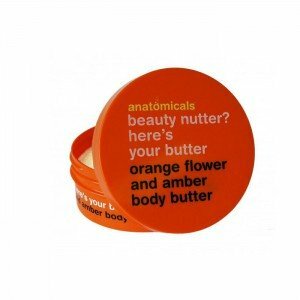 Tags: anatomical body butter, anatomicals body care, Beauty Nutter, beauty nutter here is your butter, body butter, body butter for men, body lotion, Here's Your Butter, orange body cream. ‘Nutter’ is a british term. (we british lover our quaint little terms). it means someone who is psychotic. so to all those crazies who will do anything to get hold of this fabulous body butter, please stop kidnapping our mother. oh yes, and kindly remove that knife from your hand. Conditions skin, replenishing skin’s moisture, leaving it soft and smooth. Orange flower and amber body butter smells absolutely amazing. the fragrance/ You will be like “oh my god I think I need a perfume of this”. it smells like a flowery version of amber, which… I hope you already know what “amber” smells like, because if not, we have not the slightest clue how to explain it. the scent lasts for several hours after applying, too. the only downside to this being quite heavily perfumed is that if you’re sensitive to perfume, you may not be able to use this. aside from the scent, the body butter is indeed quite hydrating, too. it’s maybe a little thinner than one would expect a body butter to be — it’s more like a slightly thickened body lotion, but that does mean it spreads very easily and is absorbed quite rapidly. it doesn’t leave a sticky “film” behind, either, like some body butters do. it does leave skin feeling nice and soft all day. Apply to skin and rub in.